HARVEST. The very word gives a warming glow, the thought of gathering in the food grown in sun kissed fields. Harvesting is the process of gathering a crop from the fields. But we harvest too in our gardens. The gathering of the food was of such importance that many societies and religions have a feast or festival and a blessing. The word "Harvest" comes from the Old English word hærfest, meaning the crop gathering season. The word has come to mean the entire process of gathering the product. This year, I have been given a mountain of apples, far more than I could possibly use. I found an old farmhouse recipe book which was full of ideas. A sweet or bitter fruit, the apple indeed was mentioned in very early times in the Bible and the tree is believed to have been one of the first to be grown. They are traditionally picked in late autumn but they are grown throughout the year somewhere in the world nowadays. .
Apples were brought to America by colonists in the 17th century as the only native apples were crab apples.There are now many varieties of apples and apple products. With so many apples we decided to freeze some in slices. This is how we did it. I had some help from my husband in the peeling. He peeled; I sliced. We then sprinkled them in lemon juice and put them on flat trays. We "open-froze" them for about 45 minutes and then quickly transferred them to foil dishes and returned them to the freezer. These can be used at a later date for sauces, pies, crumbles etc. Put apples, zest and water in a pan and soften . Add sugar and butter and blend until smooth. Place in warm, sterilised jars. Seal with waxed discs and put the lid on . Place all the ingredients in a pan and bring to the boil. Turn the heat down and simmer slowly until all the vinegar has been absorbed. Place in warm sterilised jars. Put waxed discs on and seal the lid tightly. Store in a dark place for about 4 weeks. I still have plenty apples and will be adding recipes over the weeks. This is a very old English favourite. 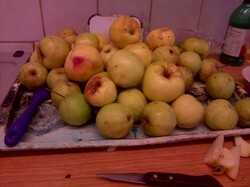 My friend used her apple harvest to make these beautiful crumbles. Place the sliced apples into an ovenproof dish and sprinkle with sugar. Rub the flour and butter together until they look like breadcrumbs . Stir in the sugar and cinnamon. Put the mixture on top of the apples. Sprinkle with crunchy brown sugar. Bake in the oven on about 180C for about 30 minutes until golden brown. Turn upside down so the fruit is on top. My favourite of all the Irish Apple Cake recipes is this one from County Kerry. Yes, I believe in eating what is in season. We had the Irish apple cake yesterday for Sunday dinner. I hope you enjoyed your apple dessert. I do enjoy apple crisp - that's what we will be having for dessert tonight! Some good tips here . I love preserving food for the cold months . Lots of lovely jars on the shelves or boxes in the freezer. I like freezing apples, slice apples as I would for apple pie, dust with cinnamon, which is a mild anti fungal, toss into a freezer bad. This saves time on Thanksgiving and Christmas when baking holiday pies. I always seem to run short on time, this helps nemeses and the apples still taste fresh. Yes, the freezing method is a good and handy one. I have added my favourite Irish Apple Cake from County Kerry to the page above for your to try if you so wish. Thank you Katie. Apples do last and your friend was right - ugly apples still taste good. At the moment the upside apple cake is going down well as it uses up so many apples and is so easy to make. Good luck with your harvest. I think nature provides us with what we need at this time of year. As requested I have added the Irish Apple upside down cake recipe above. Yes indeed. There is a feeling of satisfaction knowing that we have provided all these lovely, wholesome things for our families. It s interesting that you posted this today as I am doing an Irish apple upside cake with my Harvest today when my grandchildren visit. I am posting the recipe later after Church this morning. I am particularly interested in your dried cherries . Care to share your recipe?